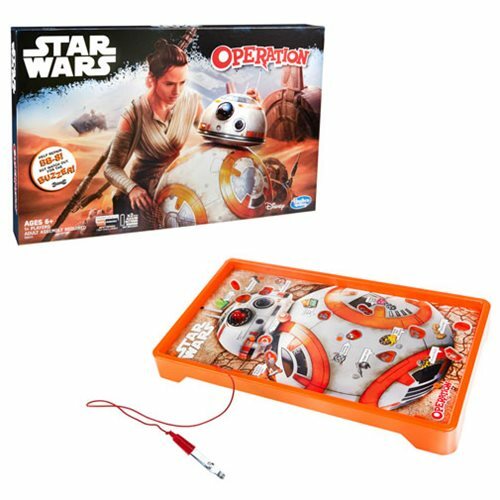 This fun version of the Operation game combines classic Operation gameplay with the excitement of the Star Wars Universe. Who can get BB-8 rolling again? After being rescued on Jakku, BB-8 is on the blink and looking for a steady hand to repair him. Remove his defective droid parts and get him rolling again, but watch out for the buzzer! The game ends when all 12 defective droid parts have been removed. Collect the most droid parts without getting buzzed, to win. 1 or more players. Requires 2x "AA" batteries, not included. Ages 6 and up.